Deb's Cup of Tea: My mother was cleaning. Mom has been going through stored boxes lately. The next visit will have boxes of things for me to look through and decide if I wish to save the contents. But she sent a letter and inside was this. 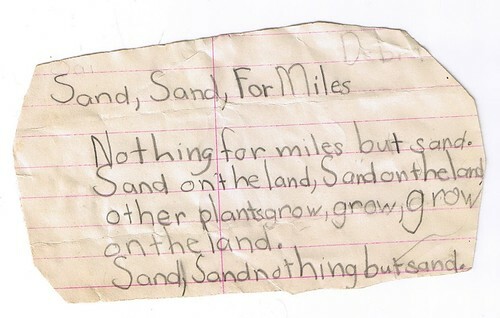 I think this is the earliest example of my writing. It's got to be from around 3rd grade since it's not in cursive and I don't think I learned cursive handwriting until 3rd grade. It's also possible it's from 2nd grade. I don't remember the context for this poem. What were we studying at the time? Was this a unit on poetry so we were asked to create our own. Was it a unit on the desert and we were asked to create something about the desert? I don't remember. What is striking is that this survives at all. Several years ago, mom handed us box with stuff she'd saved from our grade school years. There was a lot from my sister and youngest brother, but very little from the brother closest to my age or from me. I have a "hand-print" turkey from Kindergarten I need to frame and there may be a couple other art pieces but that's about it. Mom didn't know why she didn't save more when Steve and I were in school. I'm thrilled that written material survives, not just a hand-print turkey. I've always wanted to be a writer when I "grew up". Whether I have "grown up" or not is debatable but here is proof that I've been writing since I could hold a pencil and make the words. Thanks mom.